Cranbrook Megalodon Exhibit review, pics, and info – Cranbrook Institute of Science Megalodon Exhibit is located on the Cranbrook campus in Bloomfield Hills Cranbrook Institute of Science recently opened a new traveling exhibit called Megalodon – Largest Shark that Ever Lived. It’s an interactive, 5,000-square-food hands-on traveling exhibit where museum visitors will view the evolution of this enormous prehistoric shark. The traveling exhibit will be open until January 3, 2017. The Megalodon shark, related to the modern great white and mako sharks, was the dominant marine predator for 15 million years. It vanished 2 million years ago. The Cranbrook Megalodon exhibit at the Cranbrook Institute of Science does an excellent job of demonstrating the size of the Megalodon shark. The Megalodon shark teeth display, the 60-foot Megalodon “shell” display that you can walk into, and the tuna fish can pyramid showing how much the Megalodon shark can eat…all demonstrated the size of the Megalodon. 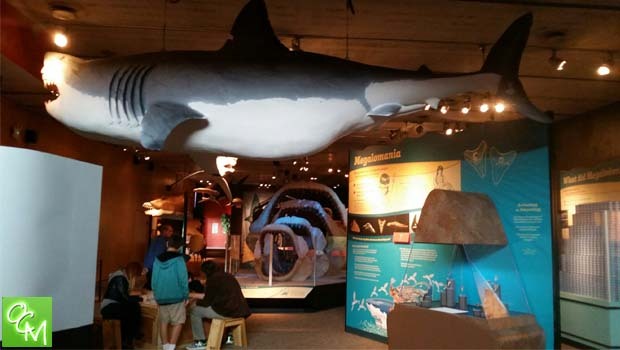 Visitors will have fun learning about the Megalodon shark through the various displays. They will also enjoy the hands on activities such as the magnetic board with the “Build-a-Shark” activity, learning about the foods a shark eats (i.e. anything! ), the Shark Tooth Study Center, the large shark teeth selfie station, etc. One other interesting display at the Megalodon exhibit was the “Oh, Bullshark” voting center. It’s based on a story that claimed there was a shark attack on Lake Michigan. Guests can read the facts and determine whether or not they believe the attack actually happened. You can cast your vote by placing a coin in the Yes bin or the No bin. It’s an all-in-good-fun way for the museum to raise a few dollars. Finally, just as with every exhibit, the Cranbrook Institute of Science maintains the theme of the traveling exhibit with the tables and gift shop. The table tops are covered with different shark pics, and the gift shop offers many shark related gifts for sale. The Cranbrook Institute of Science museum itself is also hands on and interactive and covers up-to-date scientific studies about the earth and universe. You will also find a The Story About Us exhibit, rocks and crystals, a planetarium, a mineral gallery, and more! The Cranbrook Institute of Science museum offers birthday party options, memberships, a Science shop, and a cafe.